The perfect piece for the stylish woman on the go, the Fixation Skirt will take you from work to parties and everything in between. 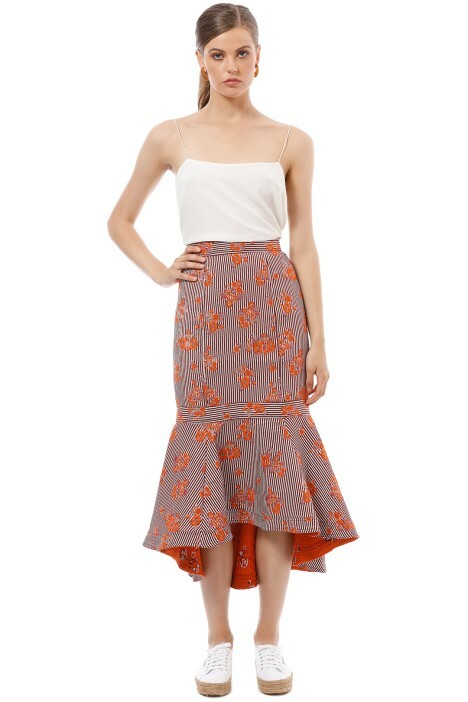 Made from jacquard fabric, the striped midi skirt sits high at the waist and features orange and pink floral motifs. Cut for a fitted silhouette, it has a peplum flounce with a high-low asymmetric hem. Hire the stunning midi skirt for a day at the races or a cocktail party. Look effortlessly chic during race day by styling the skirt with a white knit bodysuit and a vibrant headpiece. Check out our blog for some fascinator-friendly hairstyles to try! Alternatively, try pairing this with the Lucca Cami by Elka Collective. Launched in 2010 and formerly known as Cameo the Label, C/MEO Collective has established a unique aesthetic through modern silhouettes and refined directional prints. Led by head designer, Siham Elmawey, the collections are transeasonal and contemporarily classic. Born and bred in Adelaide, the label has been seen on Solange Knowles, Kourtney Kardashian, Gigi Hadid, Kylie Jenner and Emma Roberts. LENGTH: This skirt is set is midi to tea length. UNDERGARMENTS: Consider wearing a silicone cup to minimise lines and shapewear. FABRIC: Fabric has a slight stretch.